Manchester City will play Real Madrid in the Champions League semi-finals. That means City could face incoming manager Pep Guardiola in the final, after his Bayern Munich side were drawn against Atletico Madrid in the other tie. Guardiola will replace current City boss Manuel Pellegrini in the summer. The first leg will take place in Manchester at Etihad Stadium on 26 April, with the return leg in Spain's capital on 4 May. "It is a difficult draw," said former Real Madrid boss Pellegrini. "It doesn't matter which team we played. The options are the same. "I always prefer to finish at home but that is not the most important thing." The final takes place at Milan's San Siro Stadium on 28 May. 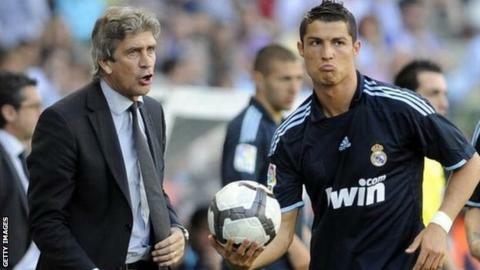 Pellegrini was manager at Real Madrid from 2009 to 2010, during which time Cristiano Ronaldo was bought from Manchester United for £80m, while Karim Benzema and Xabi Alonso were also signed. However, the Chilean was sacked after only one season and replaced by Jose Mourinho, following early elimination from the Champions League and also missing out on the domestic championship to Barcelona. Former Manchester United forward Ronaldo, 31, is the leading scorer in this season's Champions League with 16 goals. He is also the competition's all-time record goalscorer, with 93 in 125 appearances, and scored a hat-trick as Real overturned a 2-0 first leg deficit against Wolfsburg in the quarter-finals. What happens if Manchester City and Liverpool win the Champions League and Europa League? Friday's draw means there is still the prospect of a repeat of the 2014 final between Real Madrid and Atletico Madrid, when Real scored three times in extra-time to beat their city rivals. Atletico reached the last four by knocking out reigning champions Barcelona in the quarter-finals. Bayern Munich, top of the Bundesliga table, are five-time champions of Europe, their last success coming in 2013. The draw means four Spanish clubs could contest both the Champions League and Europa League finals after Sevilla and Villarreal were kept apart in the Europa League semi-finals. Real Madrid manager Zinedine Zidane has dismissed suggestions from the Spanish media that facing Man City represents another favourable draw for his side after they avoided Atletico and Bayern. The 10-time European champions knocked out Italian side Roma in the last 16, before beating Wolfsburg - currently eighth in the German Bundesliga - to reach the last four. "I don't agree that our knockout ties are always the easiest," said Zidane. "You've already seen us lose 2-0 in the first leg against Wolfsburg, so I don't want to hear this. "Everyone we've faced so far have been strong: Roma, Wolfsburg and Manchester City. "It will be a very difficult knockout tie. The only positive is that we play the second leg at home. I'm certain that it will be a real battle." Bayern's former Barcelona manager Pep Guardiola will try to outwit Atletico counterpart Diego Simeone when the pair meet again in the other semi-final. The sides play at Atletico's Vicente Calderon stadium on 27 April, with the return leg at the Allianz Arena on 3 May. "I know the Spanish league very well and I know how strong Atletico are," said Guardiola. "They know exactly what they have to do. It's always very complicated against them. We need 90 minutes and then another 90 minutes of full concentration. "Diego Simeone is one of the best coaches in the world. He's changed the club; Atletico have reached a new level over the last five years." Bayern sporting director Matthias Sammer added: "Atletico are monsters of passion. They are honest and authentic."